Click HERE to view this newsletter on the web. The Tradewinds Education Center Chadwicks Vocational School was recently dedicated to Susan Constantino, President and CEO of Cerebral Palsy Associations of New York State. The new name was unveiled at a ceremony in Chadwick on November 22. Ms. Constantino has been a longtime advocate and supporter of children and adults with disabilities and a friend and champion to the families supported by Upstate CP and other CP of NYS Affiliates across the state. 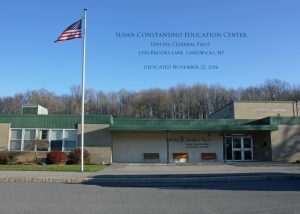 The Susan Constantino Education Center at Upstate Cerebral Palsy is located at 3390 Brooks Lane in Chadwicks, New York. The facility’s programs offer a unique educational experience for middle and high school age students preparing for graduation, employment and supportive living transitions. The program includes a comprehensive curriculum, instruction, on site vocational training, community based job experiences, and activities of daily living geared to prepare students to realize their potential and meet goals for employment and for independent living. 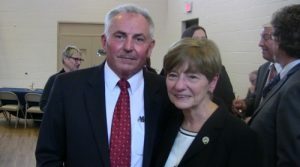 “We are honored to dedicate our vocational school to Ms. Constantino whose career has been focused on the empowerment of people with developmental disabilities. 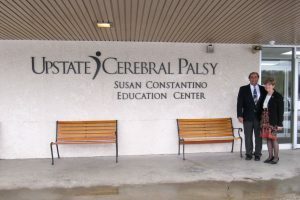 It is fitting to have her name on the building that prepares our students for independent and fulfilling lives,” said Louis Tehan, President and CEO of Upstate Cerebral Palsy. Stephen Lipinski, an Ithaca resident and Franziska Racker Centers Board Member, has been elected to a two-year term as Chairman of the Board of Directors of CP of NYS. Mr. Lipinski was elected at the CP of NYS annual meeting in October. Mr. Lipinski operates a commercial real estate and consulting practice in Ithaca, specializing in the brokerage of hotels, restaurants, and other hospitality related properties. He has been involved in the hospitality industry in the Finger Lakes for more than 40 years. 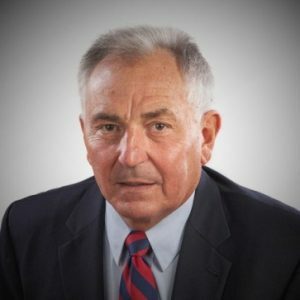 First elected to the CP of NYS Board of Directors in 2006, he served as a Director at Large until being named Chairman of the Audit and Risk Committee in 2010. He served as Vice Chairman from 2012 until his election as Chairman. 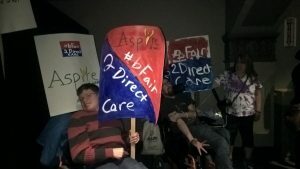 The #bFair2DirectCare campaign has continued to press the point that the Governor needs to put funding in his proposed budget to support a raise for direct care staff at non-profit agencies that provide support and services for people with developmental disabilities. A news conference and rally in Buffalo on November 29 drew more than 200 participants to highlight the #bFair2DirectCare “300 Days to Better Pay” campaign calling on Governor Cuomo to provide funding in the New York State budget to increase wages for underpaid staff at non-[profit agencies providing supports and servi9ces for people with disabilities. Attendees included people with disabilities, family members, staff and volunteers from non-profit agencies from western New York. The event also included remarks by former Congressmember Tom Reynolds, the father of a son with developmental disabilities, Assemblymembers Crystal Peoples-Stokes, Sean Ryan, Robin Schimminger, Michael Kearns, MOA-elect Monica Wallace and State Senators Timothy Kennedy, Michael Ranzenhofer, Patrick Gallivan, Robert Ortt, and Senator-elect Chris Jacobs. 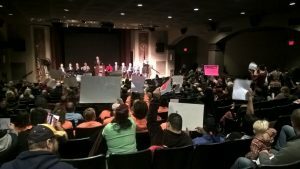 Rallies in Glens Falls on December 15 and Rochester on December 16 were attended by hundreds of staff, volunteers, family members and New York State Legislators, all calling on the Governor and the Legislature to provide additional salary monies for staff who work with people with developmental disabilities. These agencies and their employees are providing programs and services mandated by the State. They do the same jobs as employees working in State-run facilities, but they are compensated at a much lower rate and many have not had a raise in years due to cuts and freezes in support from the state budget. Additional events are being planned for January and a Holiday Season Social Media Campaign is underway right now. The majority of the changes (expanded service coordination responsibilities, revised transition procedures, etc.) have already been put into practice as a result of NYS statutory changes in 2012 and other recent federal changes. The new regulations also grant DOH/BEI authority to revise the reimbursement methodology for service coordination. Please note also that this is the first of two regulatory amendment packages being proposed by DOH. The second package, which may contain modifications affecting referral, evaluation and assessment and other programmatic areas, has not yet been published for public comment. DOH has heard preliminary feedback from the Early Intervention Coordinating Council (EICC) and other stakeholder groups and is in the process of revising these proposed regulations. We will keep you advised when these are officially published and available for public comment. Scott Sandman has been named Director of Communications for OPWDD. He replaces Jennifer O’Sullivan who has accepted a position with the Lieutenant Governor’s Office. Mr. Sandman will serve on OPWDD’s Leadership Team and will be responsible for managing the day-to-day operations of the Communications Department. The OPWDD release indicates that he has significant external and internal communications experience in both New York State government and the private sector. Mr. Sandman began his new role on December 5th. Five CP of NYS Affiliates recently received grant funding from the Dormitory Authority of the State of New York (DASNY). Aspire of Western New York received $306,491; The Upstate Cerebral Palsy Root Farm received $139,313; and Empower ($299,000); CP of NYS – Metro Services ($898,498) and Happiness House ($587,942) also received funding for specific projects. Aspire of WNY received funding for Internet Technology items such as a backup virtual server, Hl7 software and server, tablets for community based staff and some hardware to facilitate expansion at their main site. Empower received funds to replace the roof and HVAC system at the building that houses their administrative facility, school and health clinic. Upstate Cerebral Palsy will construct a fire access road and a fire pond and dry hydrants. The request focused on improving safety and providing local fire departments with a water source to fight a fire if one was to occur. The pond will also create recreational opportunities for the individuals they support including fishing and other aquatics based activities. Metro Services – The Telemedicine Triage Project will replicate a successful pilot program developed in collaboration with the Staten Island PPS and StationMD, a group of Emergency Room Physicians operating a remote triage system. During the pilot, patients living in select residences operated by CP of NYS were able to avoid going to the emergency room 79% of the time. The NICIP grant project will create the infrastructure to scale the program to operate in 106 residences in all five boroughs in NYC. Staff in the residences will be trained to utilize telemedicine equipment which includes a secure wireless laptop, cameras and video, digital stethoscopes and other remote diagnostic devices so that a physician can remotely assess a patient’s condition, make an informed decision and direct a course of action. Happiness House – Their Geneva location is home to Early Intervention, Preschool, Day Care and an Article 16 Clinic site. Most of the current HVAC system is old and beyond its useful life. Many of the location’s windows are cracked; do not close with a proper seal, or present opportunities for mold due to water condensation and an outdated, rusting and leaking air conditioning system. The funds received will be used to replace the entire HVAC system and all windows throughout the Geneva location.